4: Planar or Nonplanar?”. Journal of Chemical Education 89 (3): 417–418. Bibcode: 2012JChEd..89..417D. doi:10.1021/ed200202r. ^ Reed, D. A.; Olmstead, M. M. (1981). “Sodium oxalate structure refinement”. Acta Crystallographica Section B 37 (4): 938–939. doi:10.1107/S0567740881004676. ^ Beagley, B.; Small, R. W. H. (1964). “The structure of lithium oxalate”. 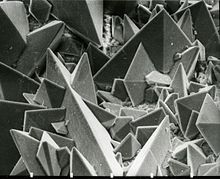 Acta Crystallographica 17 (6): 783–788. doi:10.1107/S0365110X64002079. ^ a b Dinnebier, Robert E.; Vensky, Sascha; Panthöfer, Martin; Jansen, Martin (2003). “Crystal and Molecular Structures of Alkali Oxalates: First Proof of a Staggered Oxalate Anion in the Solid State”. Inorganic Chemistry 42 (5): 1499–507. doi:10.1021/ic0205536. PMID 12611516. 4”. Journal of Computational Chemistry 2: 20–29. doi:10.1002/jcc.540020106. ^ Dewar, Michael J.S. ; Zheng, Ya-Jun (1990). “Structure of the oxalate ion”. Journal of Molecular Structure: THEOCHEM 209: 157–162. doi:10.1016/0166-1280(90)85053-P.
^ Herbert, John M.; Ortiz, J. V. (2000). “Ab Initio Investigation of Electron Detachment in Dicarboxylate Dianions”. The Journal of Physical Chemistry A 104 (50): 11786–11795. Bibcode: 2000JPCA..10411786H. doi:10.1021/jp002657c. ^ Streitweiser, Andrew, Jr.; Heathcock, Clayton H. (1976). Introduction to Organic Chemistry. Macmillan. p. 737. ^ Resnick, Martin I.; Pak, Charles Y. C. (1990). Urolithiasis, A Medical and Surgical Reference. W.B. Saunders Company. pp. 158. ISBN 0-7216-2439-1. ^ Coe; Evan; Worcester (2005). “Kidney stone disease”. The Journal of Clinical Investigation（英語版） 115 (10): 2598–608. doi:10.1172/JCI26662. PMC: 1236703. PMID 16200192. https://www.ncbi.nlm.nih.gov/pmc/articles/PMC1236703/. ^ Betsche, T.; Fretzdorff, B. (2005). “Biodegradation of oxalic acid from spinach using cereal radicles”. Journal of Agricultural and Food Chemistry （英語版） 53 (25): 9751–8. doi:10.1021/jf051091s. PMID 16332126. ^ Morozumi, Makoto; Hossain, Rayhan Zubair; Yamakawa, Ken'ichi; Hokama, Sanehiro; Nishijima, Saori; Oshiro, Yoshinori; Uchida, Atsushi; Sugaya, Kimio et al. (2006). “Gastrointestinal oxalic acid absorption in calcium-treated rats”. Urological research 34 (3): 168–72. doi:10.1007/s00240-006-0035-7. PMID 16705467. ^ Hossain, R. Z.; Ogawa, Y.; Morozumi, M.; Hokama, S.; Sugaya, K. (2003). “Milk and calcium prevent gastrointestinal absorption and urinary excretion of oxalate in rats”. Frontiers in Bioscience（英語版） 8 (1–3): a117–25. doi:10.2741/1083. PMID 12700095. ^ Pabuççuoğlu, Uğur (2005). “Aspects of oxalosis associated with aspergillosis in pathology specimens”. Pathology – Research and Practice 201 (5): 363–8. doi:10.1016/j.prp.2005.03.005. PMID 16047945. ^ Lieske, J. C.; Goldfarb, D. S.; De Simone, C.; Regnier, C. (2005). “Use of a probiotic to decrease enteric hyperoxaluria”. Kidney International 68 (3): 1244–9. doi:10.1111/j.1523-1755.2005.00520.x. PMID 16105057. ^ Syed, Fahd; Mena Gutiérrez, Alejandra; Ghaffar, Umbar (2 April 2015). “A Case of Iced-Tea Nephropathy”. ニューイングランド・ジャーナル・オブ・メディシン 372 (14): 1377–1378. doi:10.1056/NEJMc1414481. PMID 25830441. ^ Siener, R.; Bangen, U.; Sidhu, H.; Hönow, R.; von Unruh, G.; Hesse, A. (2013). “The role of Oxalobacter formigenes colonization in calcium oxalate stone disease”. Kidney International 83 (June): 1144–9. doi:10.1038/ki.2013.104. PMID 23536130.